One of the things I enjoy doing when I’m back home in Gothenburg is using the swimming baths at Lundby. There are two reasons. First, obviously, is the swimming. Second is the sauna (bastu in Swedish) that I take afterwards. The heat, the steam, the subdued lighting – it’s very relaxing. If you’re lucky you also get to hear some interesting conversations and stories. There are several old men who use the sauna. They’re long retired now, but once they were sailors, or dockers (what Americans call longshoremen), or shipbuilders. Some are Gothenburgers born and bred, others came to Sweden in the 60s from Turkey, Greece or the former Yugoslavia. Most of them are big men – not particularly tall, but large all around. Muscular once I suppose, now tending to fat. A few of them are smaller, wiry still despite their years. On this occasion the sauna wasn’t crowded. The Balkan Gentlemen’s Club was meeting in the warm room outside. There were only three of us in the steam room. I was up on the top shelf at the back and that gave me an advantage in the eavesdropping as I was out of line of sight for my companions. They may have forgotten I was there. These two, of the smaller wiry type, are not ones I usually enjoy listening to. The one is forever bellyaching about foreigners and politicians and immigrants and how things used to be better. But it was his companion, normally silent, who was doing the talking now, and he was remembering something quite different. I never heard how the story started, I first started listening in when I heard him mention Sundsvall. Sundsvall, away in the north on the Baltic coast, was my home for ten years in the 80s and 90s. You don’t often hear Gothenburgers talk about it, so of course I pricked up my ears and listened in. “Forty-six, forty-seven. Just after the war and I was fifteen. My first job, right? So I was down in the engine room with the engineer and the whole machinery opened up trying to fix it, and the captain comes down and tells us to put it back together because we’re sailing. “So the Beda’s out on the water and we’re talking and wondering what the rush is all about. The captain isn’t saying, but he keeps getting called up on the radio. It’s the owners, right? And they want to know where we are and how fast we’re going and why we aren’t there yet. “Off Varberg. I mean, we didn’t get far, right? And there’s a lot of clanking and smoke and the engine packs up. We’re coasting. So the captain comes down to the engine room to see what’s going on, and he tells us to get the reserve up and running, sharp about it. So we do that, and the Beda starts to make headway and while I’m keeping the reserve engine turning over, the engineer’s got the cowl off he’s stripping the main engine down to find the fault and fix it while we’re underway, but he can’t. Something’s shot. “We think for sure we’ll put in some place and maybe get the parts we need. But the owners are still chasing the captain over the radio and we go on, past Helsingborg, past Malmö, and we round Falsterbo. And the engineer tells the captain we need to put into Trelleborg for parts, and the captain calls him an idiot and a dumb-skull and says we’d lose more time than we can afford. The ship may be slower, but she’s still moving. If we put into port she’ll just stand still. “So on we go, and I’m tending the reserve engine and the engineer comes and tells me he doesn’t know what I’m doing, but I’m to keep on doing it because he’d thought it would have packed up by now, but the captain wants us to get all the way to Sundsvall on it. “So I keep on, and I’m talking to the engine like it’s a dog and helping it along with words, right? And we pass Ystad, and there’s Bornholm off the starboard, and then we turn north and we’re slipping along the Kalmar Sound with Öland along on one side and Småland along on the other. “We’ve got good weather and there’s a following wind and when I’m taking a break from the engine room to get some air and some food, take a crap, I see the captain going about on the deck testing the wind with his finger in the air and looking at the masts. 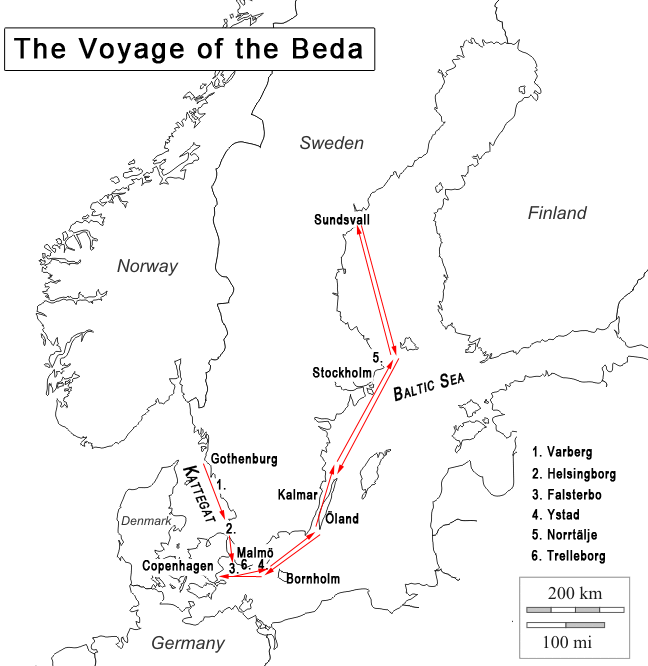 “So the Beda’s an old ship, right? Twenty, thirty years, maybe more. Steel hull, diesel engine, propeller shaft, but she was built to carry sail in an emergency. Turns out that’s what the captain has in mind. There’s a store of canvas sails onboard and he has us get them out. Well, they’ve not been used since the oil shortages in the war, and some are rotten and slit when we raise them, but some are fair enough and so we get a few rigged up and now the old ship is making better speed. It’s not like when the main engine’s driving the propeller, right, but it’s not bad and the captain’s looking more cheerful, and we’re up above Stockholm when the reserve engine dies. “I thought it was my fault for not taking care of her while I was helping rig the sails, I was just a kid. But all it was, we were out of fuel. We’d run the tanks dry. How’d that happen when the reserve engine wasn’t using half the diesel the main engine would? Turns out we hadn’t just sailed with a faulty engine – we’d also left port with half empty tanks. “Right! But that’s not the half of it. We off-loaded the machine parts and took on the load of timber, and all the time the engineer and me sat down in the engine room and looked at the pieces of the main engine and tried to put it back together, but we couldn’t get it to work. Some parts it needed and they didn’t have them in Sundsvall. Have to bring them in by train – from Gothenburg probably! It’d take a week. So the captain says, We made good time up, we’ll go back on the reserve engine and make sure we’ve got enough diesel for it this time. “And that’s what we do, right? We leave Sundsvall and head on south again. Only now the old ship’s got a heavier load and she’s got the seas and the winds against her and it’s heavy going. But we push on, back down the coast, past Stockholm and Öland and Bornholm and Ystad and somewhere off Trelleborg the reserve dies. It’s not for lack of fuel, this time we just over-ran her. She’s smoking. So the captain has us break out the sails again. “We must put in at Trelleborg, the engineer tells him, and we think he’s going to agree, but he says he’s got to report in to the owners. But now the batteries go flat and there’s no electricity. So there we are, an old steel-hulled freighter, overloaded with timber, no engine, jury-rigged sails and a storm coming up. “The captain’s about ready to try to put in at Trelleborg, when the radio operator remembers there’s a hand-cranked generator. He gets the radio working and the owners say we’re to make for Copenhagen. “So, we found out later the company was about to crash, right, and the owners thought if they got the Beda and her cargo into a Danish harbour they’d be able save them. I don’t know. By this time we’d driven far past Trelleborg and we were headed out to sea to avoid the rocks and shallows off Falsterbo, so we thought we might as well follow orders, right? That was the worst part of the sailing, we were trying to cut across the face of the wind in high seas, but we managed it and when we got into the Kage the winds and seas let up some and we were able to control the ship, and then I got the reserve engine started up again – maybe it was just overheated – but we came into Copenhagen under power anyway.